Today there are over 450 individuals that make up the Massachusetts Promise Fellowship alumni network. Our alumni move on from our program to a variety of exciting opportunities, including graduate school, law school, medical school, and careers in both the private and public sectors. They carry their Fellowship experience with them and continue to be community leaders and role models wherever their paths may lead. Connect with other Fellow Alumni on the Massachusetts Promise Fellowship Alumni LinkedIn page. On average, 25% of Fellows are hired by their host site for full-time employment following their year of service. After your year of service with MPF, continue pulling your weight by participating in the MPF Alumni Program! Whether you are interested in leading a training at a Fellow Monthly Meeting, or becoming a mentor for a new Alum, there is something for everyone. 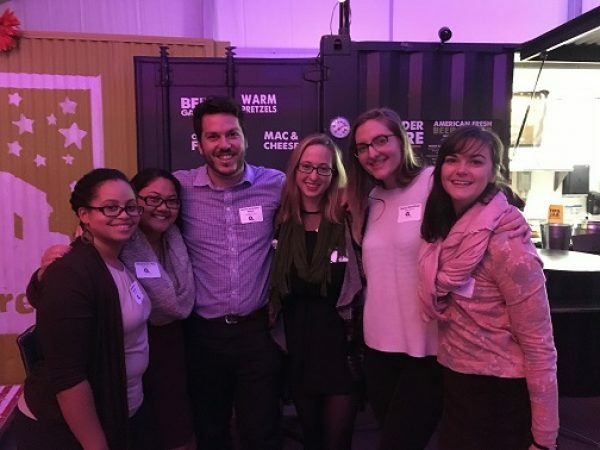 Fellow Alumni Mentor (FAM) Program-If you’re interested in connecting with current Fellows and feel like you would be a good mentor, then the FAM program is a perfect fit for you! Alumni Mentors are matched with a current Fellows to help guide them through their year of service and beyond. Be a Monthly Meeting Trainer-Are you interested in sharing your skills and experience with current Fellows? Stop by for lunch and a chat or lead an MPF Training/Workshop at one of our upcoming Monthly Meetings. Share your experience and distribute resources that fellows can bring to their host sites. Pass the Wagon Host Committee-Do you like planning large events, enjoy fundraising, or just like to socialize with other Alumni? Joining the Pass the Wagon Host Committee might just be the thing for you! Get involved in the Red Wagon Award nomination and selection process, solicit auction items, and recruit community members and Alumni to attend our always classy fundraising event.